I sent you 11 photos. I found this exact motif on a patriotic Civil War token. 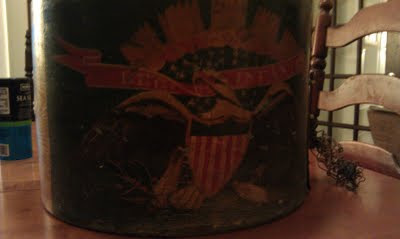 I don't know if it's clear enough, but there is a pole in the center of the drum painting with a liberty cap on top. The grommet hole appears to be ivory or bone. One drum skin is broken, the other is intact with the shadow of the snare visible on the skin. 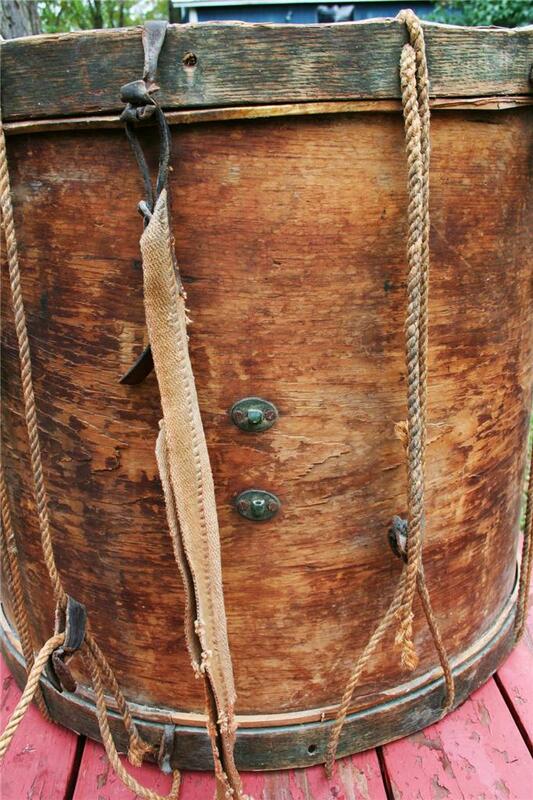 The hoops fit the drum exactly and also appear to be hand painted. That's about all I know except what I read on your website. If anyone can shed some light on the painted emblazonment or any other aspect of this drum, please write to us at BlogMaster@FieldDrums.com. This drum is the first Tompkins drum we have found that lacks the signature inlay designs and that carries only a painted emblazonment. Editor's Note: The painted hoops with their repeating design might be later than the CW period. We've seen black stenciled designs on drums of the late 19th century. 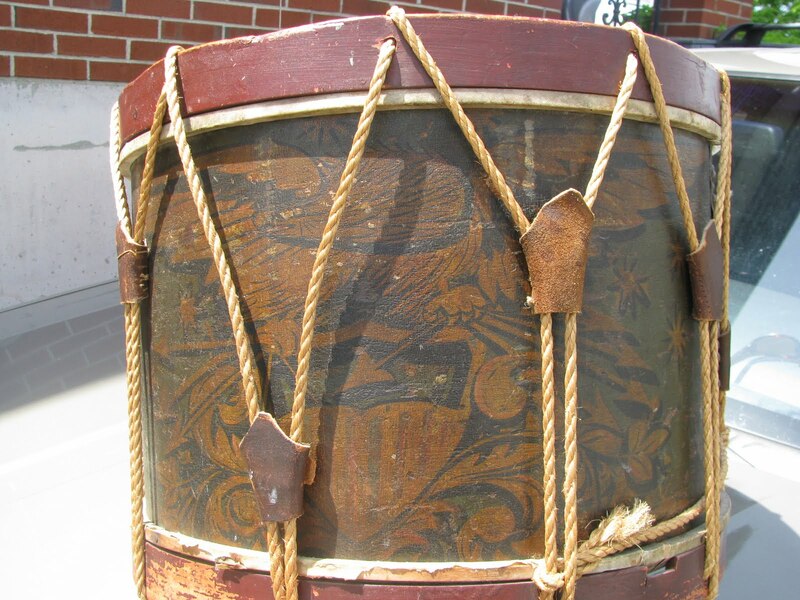 See "Tompkins 1860-1863 Masterpiece Drums -- Where Are They Now? ", this blog, Feb. 27, 2008. And see other articles on this blog re Tompkins drums by searching (upper left search box) for Wm. S. Tompkins. 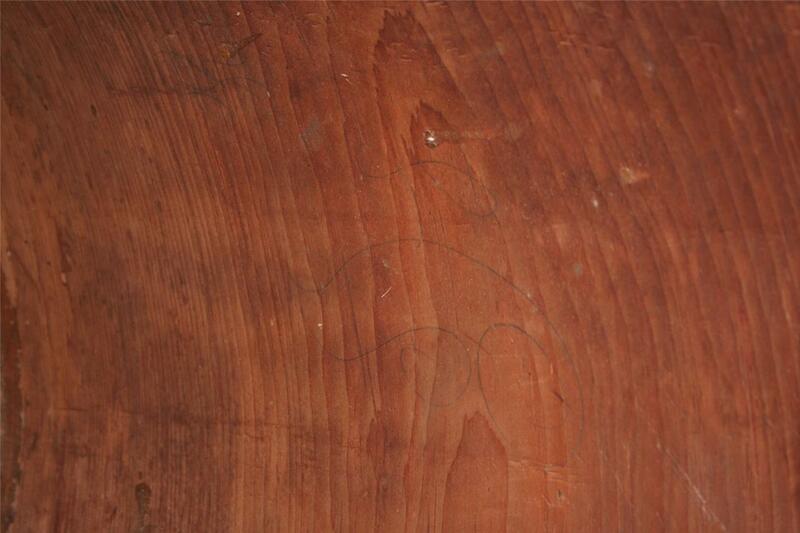 Mark Sampson, a reader of this blog, sent the below photos to us asking where he might get it appraised. He referred to it as an 1833 "Eli Drum" (possibly referring to Eli Brown). 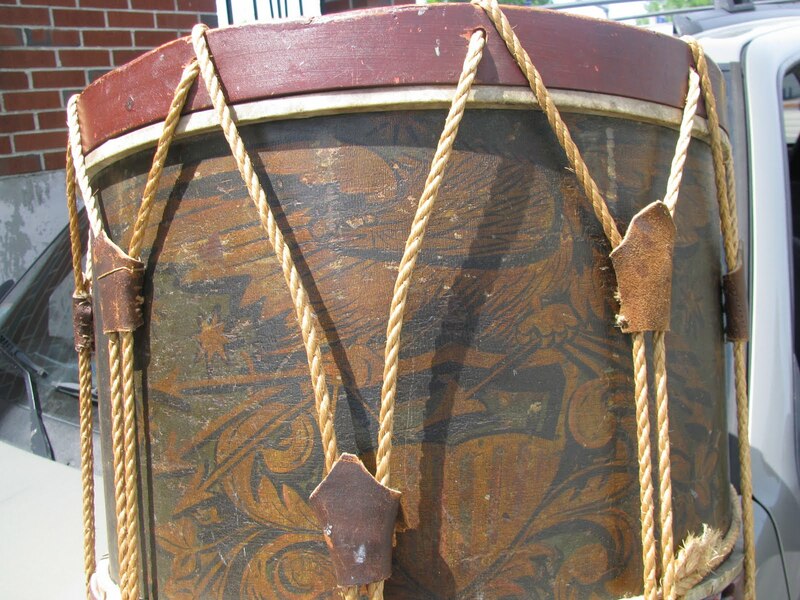 To my knowledge I do not believe there has been any restoration done to this drum. I tried to take a photo through the air hole but it did not work. Windsor (Winterbury Soc.) Conn 1833 No. / 712"
The sticker has some boarder around it. The #3 in 1833 is hand written as is the 712. "There are 13 missing tacks. 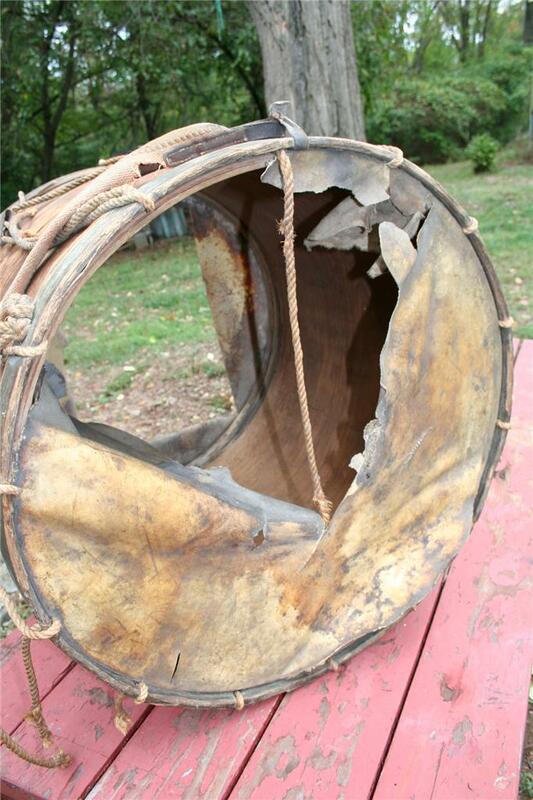 They seem to be missing at the outer edges of the drum. Very interesting design with diamonds and circle around the vent hole. I do not think it was restored but would appreciate any information. I think it is a real nice piece of Americana and want to make sure it is preserved for the future." The painting on the drum is unique. I've not seen a painting quite like it. Whoever did the restoration on this drum appears to have installed the tugs upside-down. And the tugs appear to have been stained to look old (but the inside surfaces and cut edges are clearly new, as is the rope). 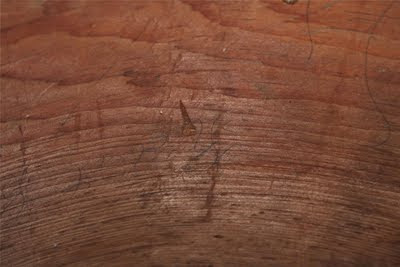 A very good craquelure (a network of fine cracks or crackles on the surface of a painting, caused chiefly by shrinkage of paint film or varnish), or wood grain underlying the paint, appears all over the painted surface of the drum. The vent hole appears to have a bone grommet (although excessively white for real bone) through which a small part of a label appears to be visible (click on the photo to enlarge it and you'll be able to see what looks like part of a printed label). A few tacks near the flesh hoops appear to have been lost or removed. 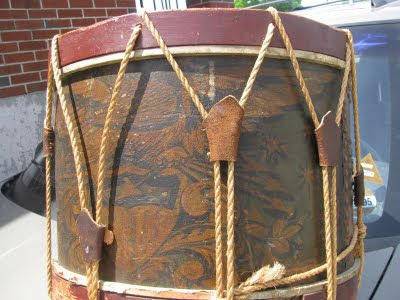 The tack pattern is clearly like those on known Brown drums of the early 19th century. Remnants of what appears to be a period snare mechanism can be seen on the bottom hoop near the snare gate. 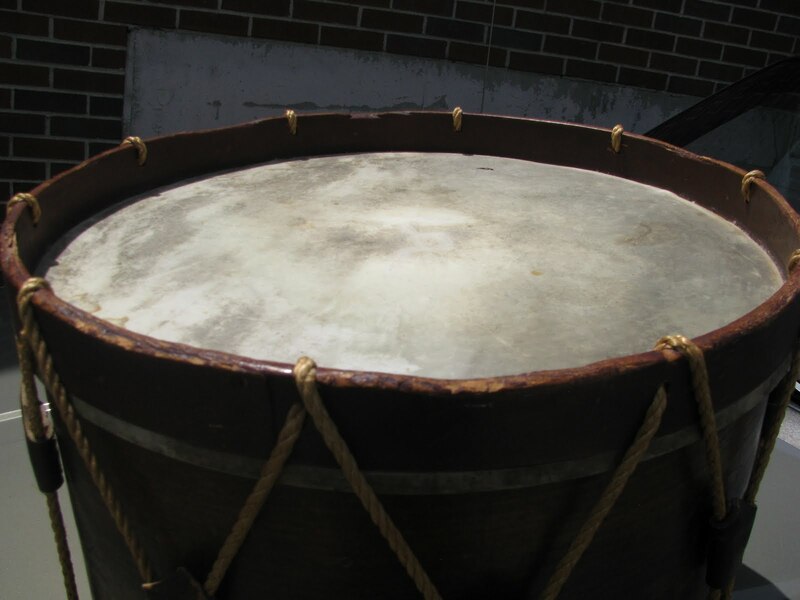 And the presence of a person's thumb (bottom left) suggests that the drum might be smaller than a usual field drum, perhaps closer to a child's toy drum size, but I cannot tell for sure from the photo. 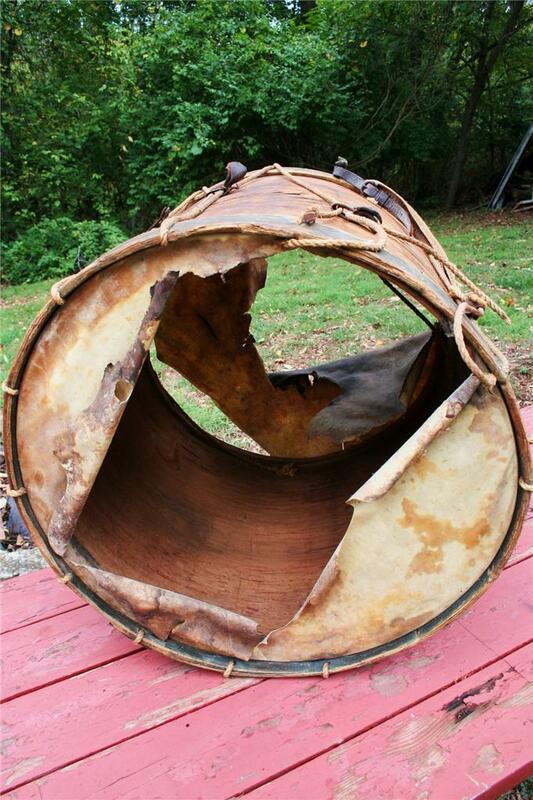 Obviously this is cut down and parts have been recycled (the leather ears were cut from a large piece that was previously seamed (one ear is "inside-out"), and top hoop looks like it's from an older drum to me). Looks like someone replaced the grommet (bone doesn't yellow with age as much as ivory does, but it does yellow, and there should be at least some dullness to the white, as you correctly point out) It's curious that there is no shellac over the entire shell, just over the painted part. decorated drums has been obviously added later. 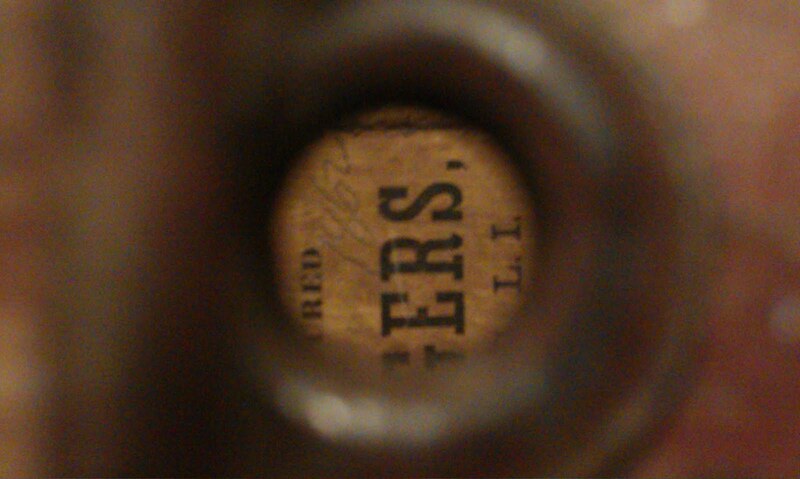 If the owner knows it is 1833, I'm thinking it is on the label. Can he send us a transcription of it? 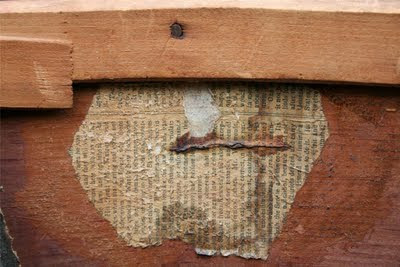 Looking at the areas where the tacks are missing, I think the cut-down was done some years ago. Also, can he tell us anything about provenance? That might help us trace the art work. I'd like to call it a Brown drum, but let's see what the label says. Maybe the owner can help us out with that. Thanks, Mark and Ellis! We knew it was cut down, and this is now verified by the number and date you supplied, indicating that this would have been a more or less "square" drum. Lots of these drums were cut down to this size around the time of the Civil War; by that time the big square drums were outdated. If there is enough label left, I might urge Mark to take a look to see if it is indeed "Eli Brown" and not "Eli Brown & Son," the reason being it's right on the cusp of when Eli's son was taken in as a partner. . if not, it is still a lovely example of Brown's work. The artwork deserves a closer look, in my opinion. Mark, where did you find the drum? Did the former owner give you any information about where (s)he found it? Thanks again for posting it, and keep us informed of where it goes if you do sell it. 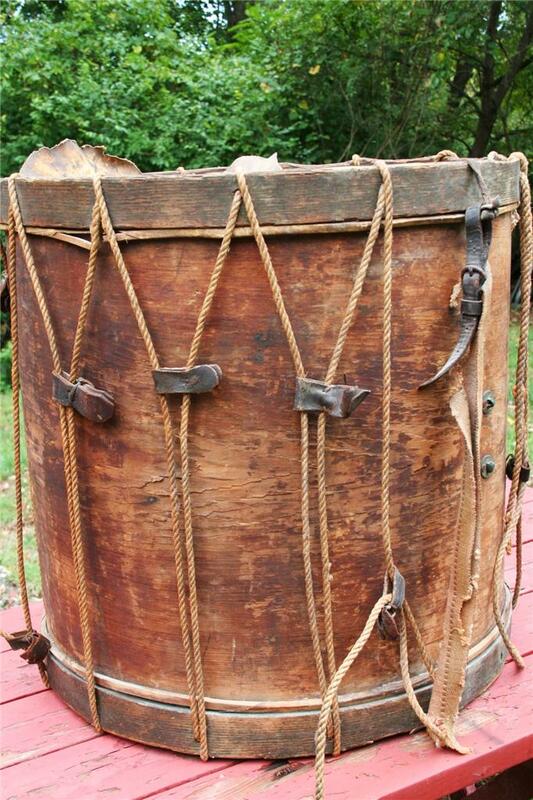 OFFERED FOR AUCTION IS AN IMPRESSIVE RARE ANTIQUE AMERICAN CIVIL WAR ERA FIELD DRUM. 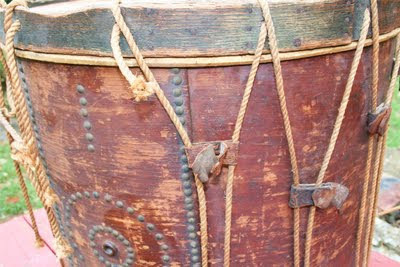 LARGE WOODEN DRUM MEASURES 24 1/4" HIGH AND 25" IN DIAMETER. 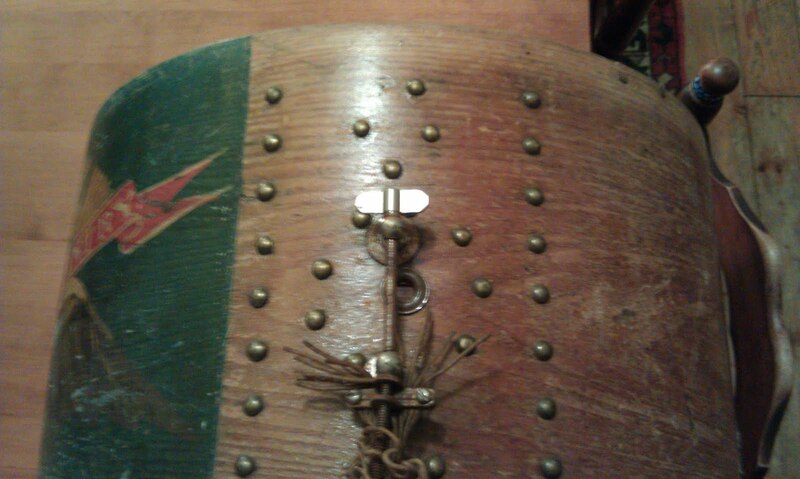 DECORATED WITH BRASS TACKS IN A ROUND PATTERN AROUND THE VENT HOLE. 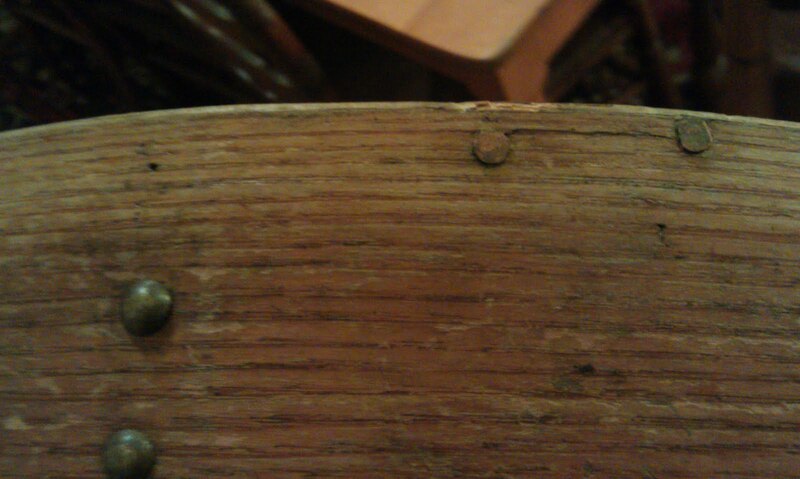 THERE IS SMALL BRASS HARDWARE ON THE OPPOSITE SIDE. I BELIEVE IT HAS WHAT'S LEFT OF THE ORIGINAL SKIN HEADS AND EARLY TIGHTENING ROPES WITH LEATHER. RIMS ARE STAINED WITH OLD BLUE PAINT. INSIDE THERE IS WRITING AND A FRAGMENT OF AN EARLY NEWSPAPER, AS SHOWN IN LAST PHOTOS. 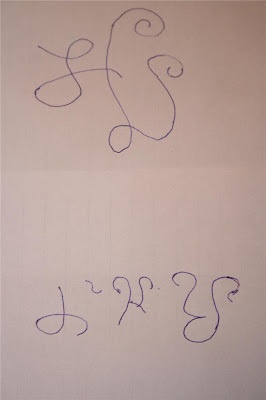 I COPIED THE WRITING ON A SHEET OF WHITE PAPER-SEE VERY LAST PHOTO. NO CRACKS IN BODY, JUST PERIOD WEAR. 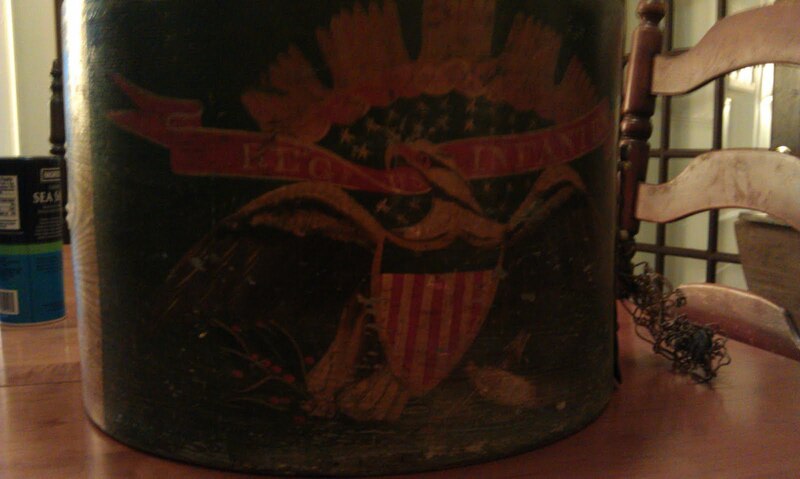 A BEAUTIFUL RARE DRUM OF CIVIL WAR TIMES. eBay item no. 290546390247, Seller kamich09 ( 888) asking $199.99 BIN price. Wow! 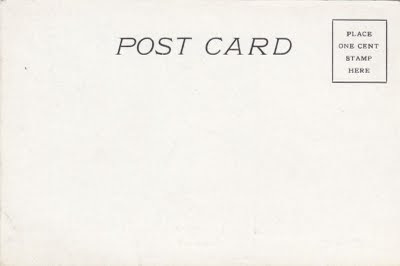 I think that's what I paid for mine, and it came with Bogart's personal copy of the 1905 edition of the AVF, another postcard of a GAR encampment, and the fife he used there. 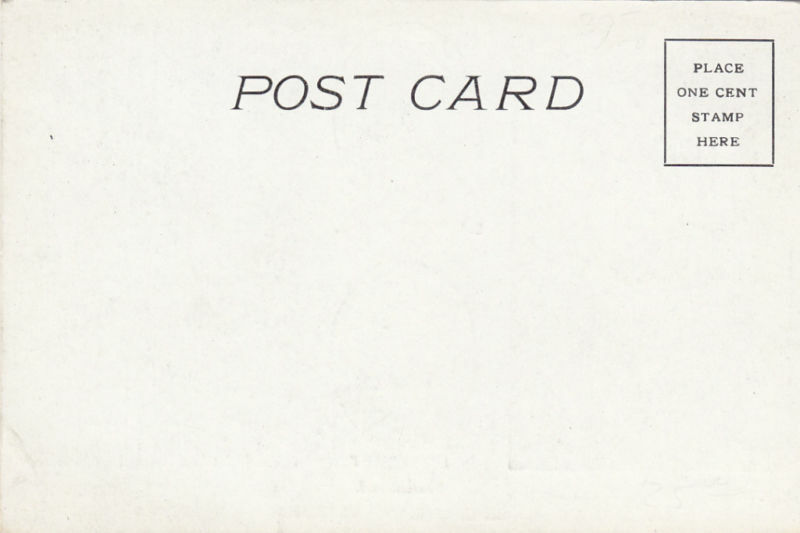 (the GAR card is inscribed to his sister, and he complains about the weather). 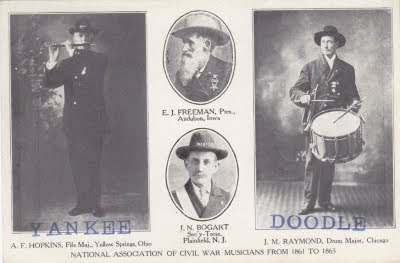 The NACWM was a fine group who fought hard to keep the field music alive in the GAR (there was evidently a move to lessen musical activities around 1911). 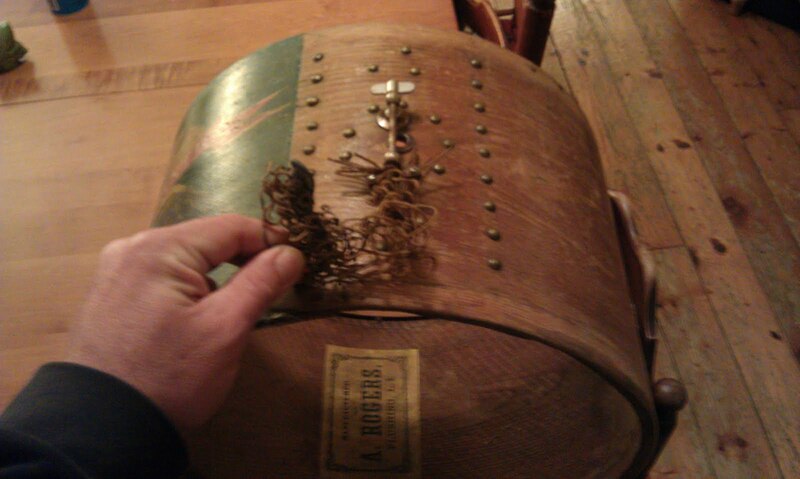 Shannon, a reader of this blog, wrote today with photos of a drum shell purchased recently in a thrift shop in Vermont (the drum was on a top shelf with Stetson hat boxes). 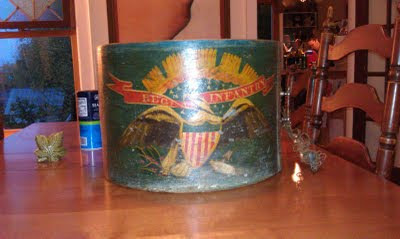 The drum shell appears to be an Army surplus (because no regiment number was painted in) contract eagle drum made in 1862 (date appears handwritten in pencil on the label) by A. Rogers of Flushing, Long Island (Flushing is a section in the north central part of Queens County, New York City, New York, east of New York County a/k/a Manhattan; it was consolidated into the City of New York in 1898 together with two other towns to form Queens County; at the time that this drum was made (1862), Flushing was a town on Long Island). The shell's painting looks authentic, largely intact with only minor paint flaking. 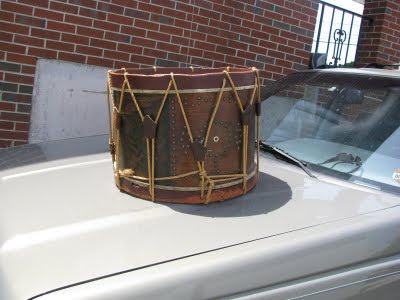 Below is a photo of another A. Rogers eagle drum discussed in a post to this blog, Sunday, January 11, 2009, titled, "A. Rogers Manufacturing Civil War Infantry Drum." Note the similar painting. Also, note that the 1862 drum shell is shorter than the other Rogers drum's shell. It was probably cut down to serve the needs of a smaller drummer, or more likely in my guesstimation to fit in with later times' styles. 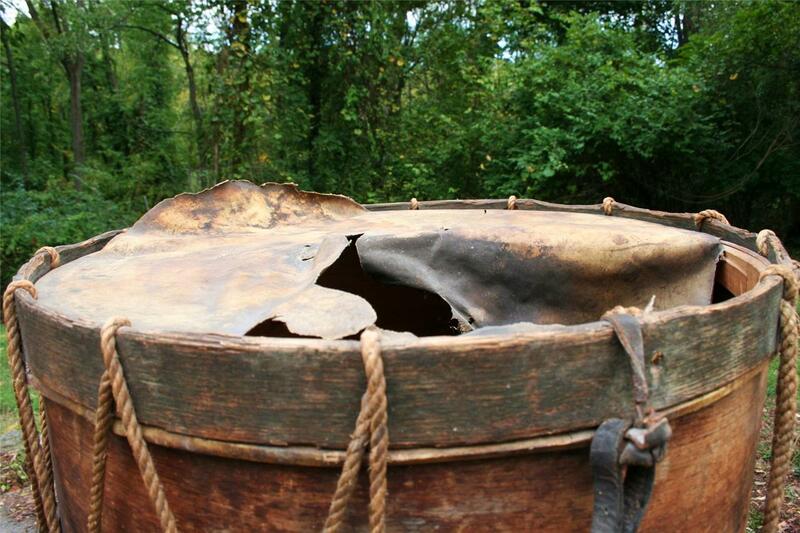 The emblazonment on the other Rogers drum clears the counterhoops with plenty of space to spare. 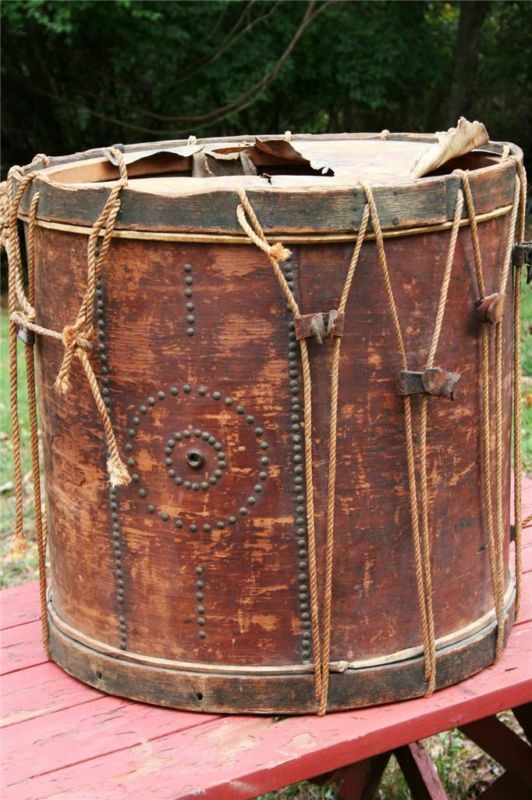 By comparison, the 1862 drum's emblazonment would be partially covered by counterhoops if converted to a player, like this 1864 A. Rogers eagle drum discussed in post "An 1864 A. Rogers Civil War Field Drum (and a Repro)," this blog, March 7, 2010. 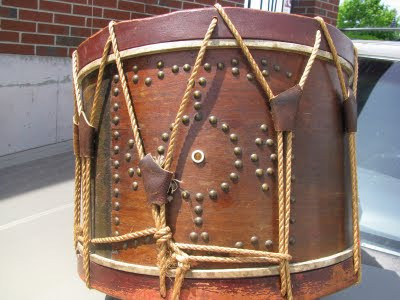 It is doubtful that a drum maker would have gone to the trouble of creating a wonderfully symetric tack pattern, only to cover it up by a slightly off-center snare mechanism. That, together with other evidence concerning the snare mechanism's early 20th century origin, leads me to think that the snare mechanism was added during the early 20th century. 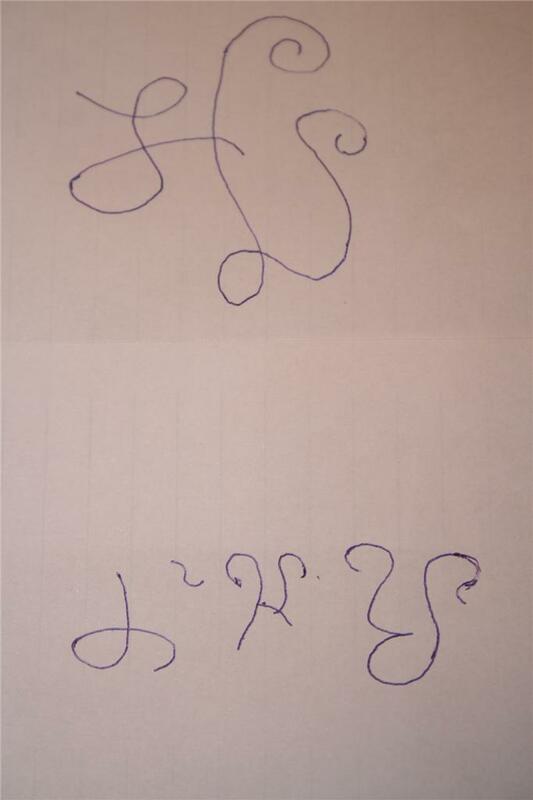 One could consider the snare mechanism like scholars consider the 19th century initials and names that are carved into the millennia-old monuments at Luxor and Giza in Egypt: historical graffiti. 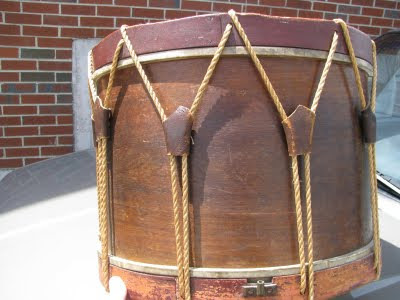 Or, if I owned the drum, I would consider the snare mechanism just adulteration and remove it, restoring the drum to its original design. The A. Rogers label with handwritten "1862" appears through the drum's vent hole. 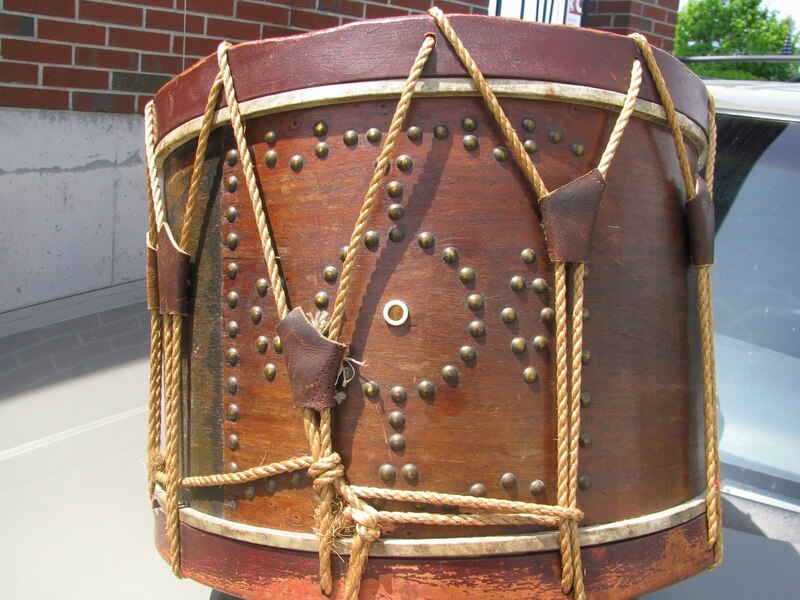 See also "An 1864 A. Rogers Civil War Field Drum (and a Repro)" in the Sunday, March 7, 2010 edition of our blog at http://blog.fielddrums.com/2010/02/1864-rogers-civil-war-field-drum-and.html. SSG Andrew Porter of the Hellcats walks through the steps of piecing together a rope-tensioned snare drum. 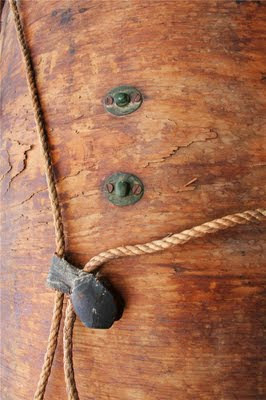 Look for a second video coming soon on applying tension and finishing touches to your rope drum. Visit www.westpointband.com or subscribe to our YouTube channel for more videos. My name is James Robinson and I have a civil war drum that was played by my ancestor Levi Perry I believe in 1861 or so. Anyway, it is in as good of shape as the one in this photo on your site [Met Museum's Soistmann Eagle Drum] and I have the sticks with it. I am a drummer myself of 45 years. I have no children to pass it on to as it was passed to me. I would like to sell it to someone who would take care of it. If you can help, let me know and I will saend pictures. 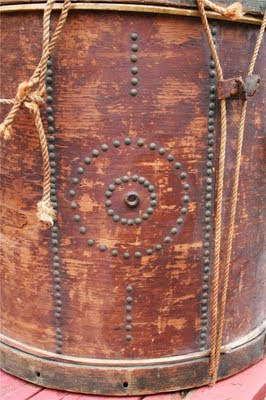 Note the following: the full painted emblazonment is not visible (top of sunburst is covered by top counterhoop and bottom of arrows are covered by the bottom counterhoop). 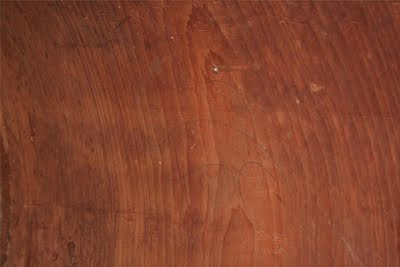 That information, considered with the views of the top and bottom heads (below) which reveal that the counterhoops are seated at approximately correct distances, suggests that the shell has been cut down, perhaps an inch of so on both ends. 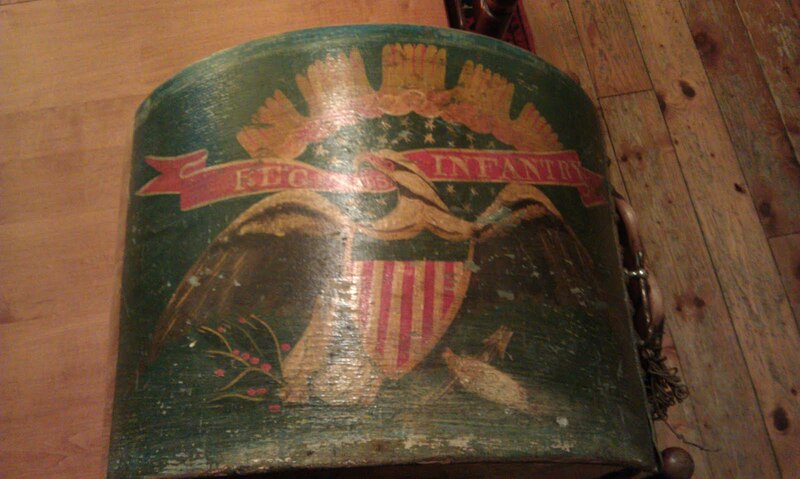 Note that the regiment number has not been painted in, suggesting that this drum was Civil War army surplus, and was not assigned to a unit for service. Note that the ends of the upper and lower triangular arrays of tacks are obscured by the counterhoops (the bottom more so than the top), also supporting the possibility that the shell has been cut down. Note the drum sticks (above and below) are not dark hardwood. The shape of the sticks is not familiar to the Blogmaster. "This issue seems to have plagued many farm families. Levi Perry, a soldier serving in a Maine regiment, for instance, wrote home to his mother when he found out that his brother had enlisted. 'I think [Chandler] has done wrong for he promised me when I left home that he would stay and take care of things at home.' Perry worried that 'now there is no one to look to things but you.' Levi Perry to 'Mother,' July 26, 1862, in Silber and Sievens, Yankee Correspondence, 138." .... War. Pg.128 2.) Levi Perry, from an article by Andy DeRoche, "Blending Loyalties Maine Soldiers Respond To The Civil War," Pg.129 …. Correspondence of the following members of the Perry family who served in the Civil War, Levi Perry: served with 4th Maine Regiment all four years of the war. Most of his correspondence (about forty letters) is to his mother Sarah Hall Perry (1861-1864). Chandler Perry, Jr. and Tad (?) Perry: correspondence to their mother Sarah Hall Perry (1863). Chandler Perry, Sr.: Correspondence to his wife Sarah (1861). Perry joined the 4th Maine Regiment, Company D, as hospital nurse and was taken prisoner in 1861. He died in Libby Prison of typhoid fever. Other topics represented include the Maine militia. The material described in this catalog record is located in the collections of the Maine Historical Society, Portland, Me. 76. LEVI13 PERRY (DIMON12, ALICE11 SOULE, MERCY10 SOUTHWORTH, MARY9 PABODIE, ELIZABETH8 ALDEN, PRISCILLA7 MULLINS, ALICE6 ATWOOD, NICHOLAS5, JOHN HEWSON4, JOHN3, JOHN2, PETER1) was born February 16, 1776 in Pembroke, Mass., and died July 12, 1847 in Poland, Maine. He married NANCY DWYNE December 01, 1796 in Poland, Maine. She died April 07, 1861 in Poland, Maine. i. JOEL S14 PERRY, b. December 08, 1797; d. September 17, 1865.
ii. ARTIMIS PERRY, b. January 17, 1800.
iii. ABIGAIL PERRY, b. May 25, 1806.
iv. LEVI PERRY, b. August 22, 1808; m. BETHIA B. PERRY; b. July 24,1836.
v. ALASON PERRY, b. April 22, 1813.
vi. JOHN L PERRY, b. 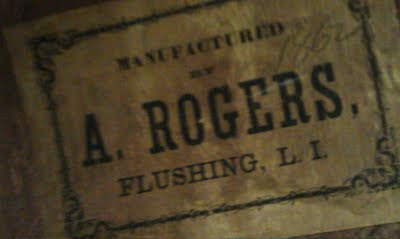 May 02, 1816; d. 1876.
vii. ALMIRA PERRY, b. November 03, 1803; d. 1861. Levi G. Perry, corporal, enlisted Oct. 28, 1862 [Company D], p. 46. ===== "4th Main Volunteer Infantry Regiment - Company D" shows Levi G. Perry of Rumford, Maine, to have been in the 4th Maine Infantry, Company D, age 20 when mustered into service June 15, 1861. Compiled by Bruce Towers, Prospect, CT (1998). Source: the "Annual Report of the Adjutant General of the State of Maine for the year ending December 31, 1863". Also, age 22 when promoted to corporal (presumably) October 28, 1862.